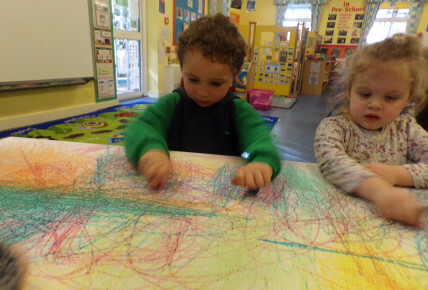 Today, our Pre-School Children enjoyed a Shake and Write activity. 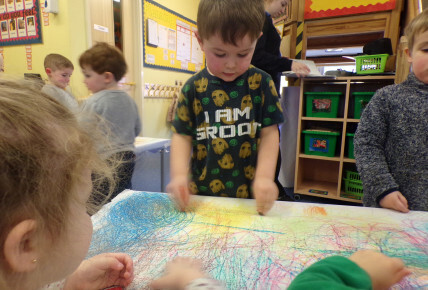 Firstly, they chose to complete the "Construction Theme" and chose to use Crayons and large sheets of paper to do make marks to the construction music. Marco sang the words from the song "Digger Digger Digger, Lifting the Dirt". Having appeared to be very confident at this theme, they then moved on to the "Train Theme". Alice said "This one is much faster". Adam said "I love going on trains with my family." Shake and write is one of the fabulous and exciting Initiatives that we have to offer here at Busy Bees Bury St Edmunds. 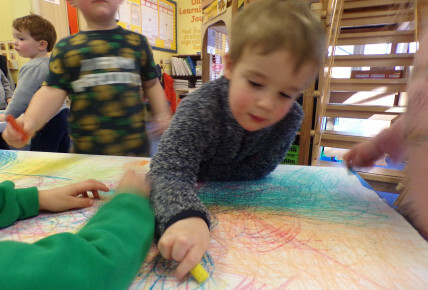 This is an approach and method to provide movement opportunities, in order to promote the physical skills that Little Ones need to develop their handwriting. This Initiative is driven by various themes of music and it's main aim to to provide enjoyment and build confidence.